2017 Julien Sunier, Morgon, Cru Beaujolais, France. Natural wine star, Julien Sunier, who got his start working in the cellar at Christophe Roumier after which he made surf and winemaking pilgrimages to California and New Zealand before starting his domaine in Beaujolais, back in 2008, getting grapes from old-vine, hilltop parcels in the Cru villages of Fleurie, Morgon and Régnié. The Dijon born Sunier has shown a remarkable flair in his recent vintages, raising his talents to the level of many top estates here like Lapierre, Foillard, Thevenet and Dutraive, with a passion for organic viticulture and non intervention gentile winemaking that highlights each terroir and vintage, these are soulful expressions and racy wines. 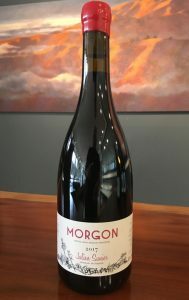 This latest release of Sunier Morgan is at first bright, but takes on a dark profile with black violets, blackberry, tangy currant, sweet strawberry and plum fruit along with a touch of stemmy spice, wild herb, anise and dark wood notes all with that carbonic opulence, but with a chewy structure and a medium weight body. The 2017 vintage, is for me, the best yet from Sunier and his flagship wine is his Morgon with it’s three lieu-dit blend from Cote de Py, Corcellette and Charms, all ancient vine sites made famous especially by Jean Foillard, set on these granite soils. Sunier employed all natural carbonic fermentation using Indigenous yeast in concrete vats at low temperatures to keep intensity of the fruit and fresh detail before using his ancient Burgundy vertical press, racking to well used barrels or Futs where the Gamey is raised for 9 months before bottling, as per normal, unfined and unfiltered with exceptionally low sulfur. While some reviewers have raised concerns for this vintage which was hit hard by hail, I have found the wines lively and minerally with a gripping sense of force, less earthy and feral as the 2016, but not as hedonistic and fruity as 2015, and I adore what I’ve tasted, again especially from Sunier, who must have really been careful in the vineyard and selective in the cellar, for me they are impressive in depth and personality. This fruit driven and floral wine takes on a more serious nature with air adding mineral tones, umami (savory) elements and length, it’s a seductively charming Gamay that lacks for nothing and has a true sense of place. Drink this is a wine that should get better over the next 2 to 3 years in bottle and have a window of a decade at least.